This week we start a plank challenge for the month of February. As in most exercises there are various ways to plank, but the first week we are going to focus on just a regular plank. 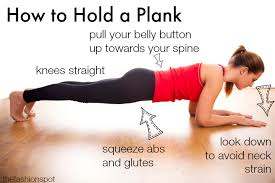 The inserted picture shows the proper and safe way to hold a plank. As it says, you want to avoid the neck strain; but also making sure to keep your core tight and focus on not letting your hips lower too much will also keep you from putting any unnecessary strain on your lower back. If you need to modify the plank, you can drop to your knees, but still keeping your core tight. This week the challenge is to plank for a minimum of 20 minutes. Time your planks, hold it for as long as you can, and keep track of your time for each hold. Add your times up and the goal is to have a total time of 20 minutes or more by the end of the week. Some of us can hold a plank for about 30 seconds, and then some of us can hold it for several minutes, either way push yourself beyond your comfort zone and hold each plank as long as possible. And remember, your mind will tell you your body is ready to stop, but in reality your body can keep going! So, make sure to get out of your head, focus, and continue to push yourself to increase your plank hold each time.